Nelda Akerson, age 85, of Aurora, passed away on Tuesday, June 6, 2017, at Tiffany Square in Grand Island. Funeral Services will be held at 2:00 P.M., Saturday, June 10th at the United Methodist Church in Aurora. Rev. Karla Sheffy will officiate. Interment will be in the Aurora Cemetery. Closed casket visitation with the family will be one hour prior to the service at the church. Memorials may be made to the family to be designated at a later date. Higby-McQuiston Mortuary in Aurora is in charge of arrangements. Condolences may be e-mailed to the family through the mortuary website at www.higbymortuary.com. Nelda May Akerson, the daughter of George Ralph and Edna (Hamburger) Read, was born near Inland in Clay County, Nebraska, on November 14, 1931 and passed away on June 6, 2017 at Grand Island, Nebraska at the age of 85. Nelda was raised on the family farm. 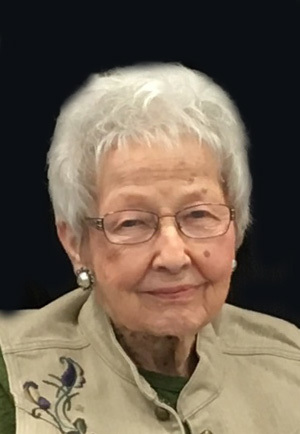 She received her education in the rural school near her parent’s home and then attended the Aurora High School where she graduated with the class of 1949. Nelda was united in marriage to Wilbur Akerson on October 5, 1951. They farmed until they retired in 1977. Farming was their life. Wilbur passed away on November 28, 1999. After his passing she was active in the farm management. Nelda enjoyed going out and watching the harvest at the farm. She liked going places and seeing people. One of her favorite spots to go to and spend time was Estes Park. She was preceded in death by her parents; husband, Wilbur; two brothers, Ralph ‘Bub’ Read, Jr. and Merle Read and a sister, Arlene Gibson and sister-in-law, Alice Athey. Those left to cherish her memory are her twin sister, Velda Anderson of Aurora; nephews, Ron (Marsha) Akerson, Bryan (Melody) Jones, Arthur (Wayne) Gibson, Tom (Sandra) Gibson, Kim Jones and Kevin (Mariel) Jones; nieces, Edna Heiden, Laurie (John) Drown, Kelly (Scott) Crabtree, Karen Read and Kay (Tim) LaPlante; many great nieces and nephews and other relatives and friends.